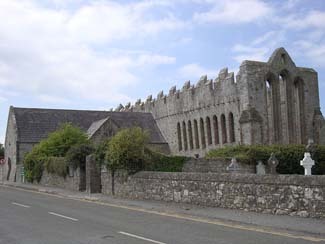 Ardfert Cathedral is built on the site of a monastery was founded here by St. Brendan 'The Navigator' in the 6th century. Ardfert Cathedral is built on the site of a monastery was founded here by St. Brendan 'The Navigator' in the 6th century. The site has three medieval church ruins, the earliest building being from the 12th century, with additions made in the 15th century when a small transept was added and battlements were constructed, an ogham stone and a number of early Christian and medieval grave slabs. The cathedral has a fine Romanesque west doorway with outward pointing chevron decoration in the Anglo-Norman style, a magnificent 13th century east window and a spectacular row of nine lancets in the south wall. Two effigies of ecclesiastical figures of late 13th to early 14th century date are mounted on either side of the east window. The battlements were added in the 15th century. 10km from Tralee on R551 (Tralee to Ballyheigue Road).